‘The Cluppin Spielers’ will perform at the Community Picnic at CBSRZ this afternoon. CHESTER — Congregation Beth Shalom Rodfe Zedek’s (CBSRZ) open to the public annual community picnic and free concert presents The Cluppin Spielers (“Clapping Players”), the new CBSRZ house band that will bring us an exceptional concert, on Sunday, June 24, at 5 p.m. Performing a mix of old and new, The Cluppin Spielers’ repertoire draws on the traditional melodies of Eastern European Klezmer, contemporary Jewish Bluegrass known as “JewGrass,” and Americana Folk. Regardless of the genre, the group’s lively, toe-tapping melodies leave audiences laughing, smiling, and clapping. Although there is no charge for the performance, concertgoers will have plenty of grilled summer fare to purchase and other foods with proceeds benefiting local charitable organizations. In the event of rain, the music will be moved inside. Bring your own entrée if you wish (out of respect for CBSRZ kosher dietary restrictions, please no shellfish or pork products). Jointly produced by our Music & More and Social Action committees, it is intended not only as a joyous music treat, but something that will benefit those in need. No reservations are necessary. Klezmer is largely dance songs for weddings, often sung in Yiddish. The word Klezmer comes from two Hebrew words, kleizemer meaning “vessels of song”. Over time the term klezmer referred to musical instruments, and later to the musicians themselves. The music of Klezmer swings and gets you on your feet. As Klezmorim brought their yiddish “folk” sounds and merged them with American culture, contemporary Jewish musicians are now taking part in a growing trend to combine Jewish spirituals with Americana – typically thought of as blue grass, folk and country music to create a new genre known as “JewGrass”. 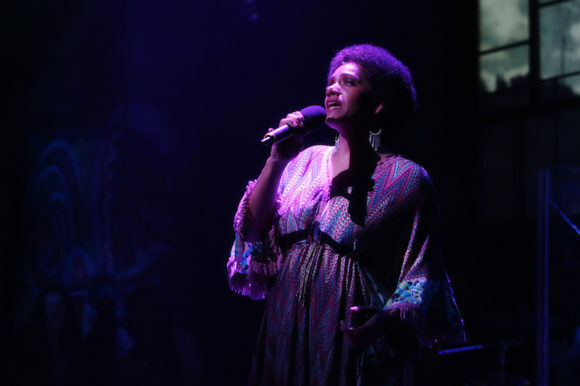 Traditional and contemporary Jewish musicians have in common the desire to push the boundaries of what’s expected, forging new ways of telling stories. After all, storytelling is second nature to Judaism, a perfect match for Americana folk tunes. The member group consists of musicians who were in A Klez Act, the previous congregation house band that has entertained audiences since 1993, as well as musicians who made folk music together when celebrating at the installation ceremony of the current Rabbi, Marci Bellows in 2016. In bringing the two groups together as one, CBSRZ joins fellow artists on the musical journey to tell stories in fun, new ways. 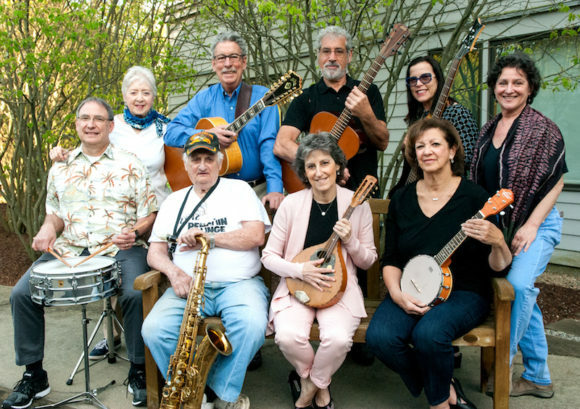 The Cluppin Spielers’ members include Melinda Alcosser – percussion; Steven Barasz – vocals, guitar; Billy Bertelli – drums; Belinda Brennan – vocals, mandolin; Meg Gister – vocals, keyboard; Neil Gottfried – vocals, guitar, clarinet; Norman Hanenbaum – saxophone; Lori Jubelirer – bass guitar; Deb Rutty, vocals; Norman Rutty – vocals, 12 string guitar; Marcy Saltzman – vocals, banjello; Joel Saltzman – guitar; Pat Smith – percussion; Shelley Sprague – vocals, guitar; Dave Zeleznik – banjo. 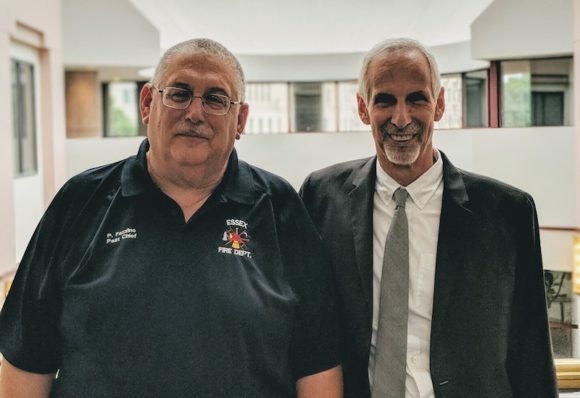 The location of this free concert and community picnic is at Congregation Beth Shalom Rodfe Zedek, 55 East Kings Highway, Chester, Connecticut. For more information, visit www.cbsrz.org/engage/events or call the CBSRZ office at 860-526-8920. 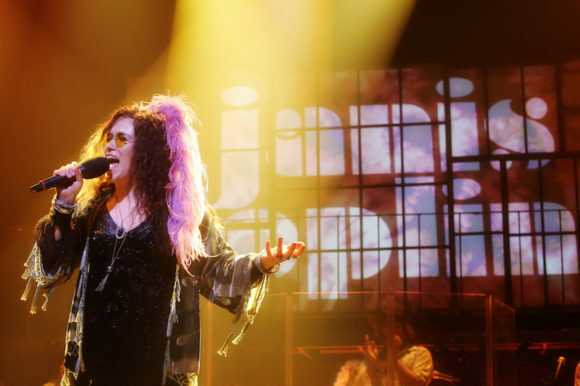 ESSEX — The Ivoryton Playhouse will present the 2014 Tony Award-nominated 2013 Broadway Musical A Night With Janis Joplin, written and directed by Randy Johnson, from May 30 to June 24. 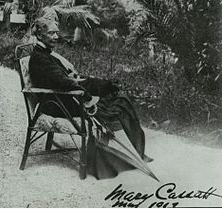 A rare photograph of Mary Cassatt — supposedly the only photograph for which she ever posed. 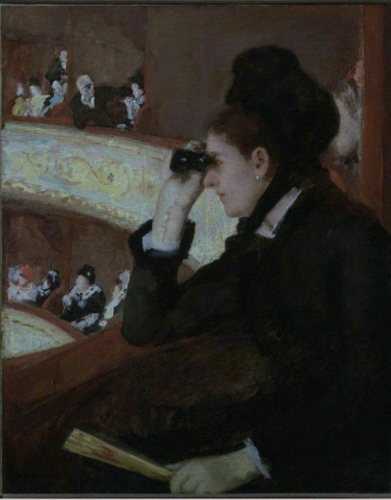 La Loge (The Theatre Box) by Mary Cassatt. 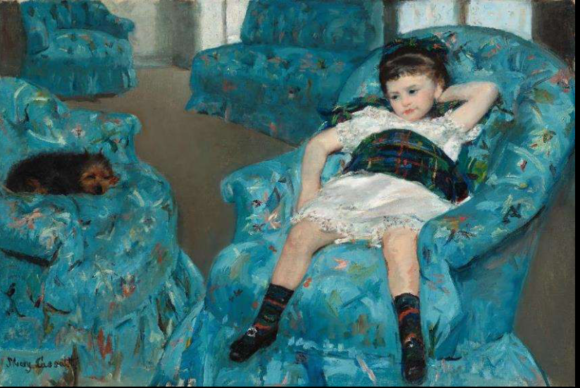 ‘The little girl in the blue armchair’ was painted in 1878 by Mary Cassatt. 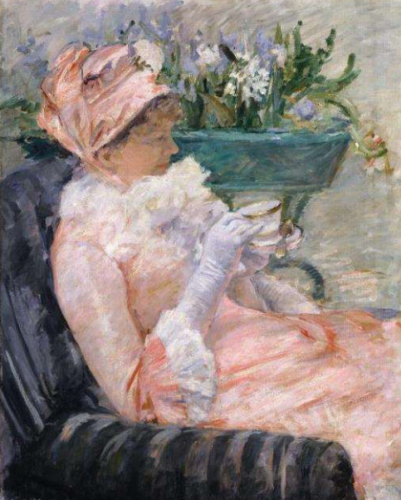 ‘The Cup of Tea’ is a classic Impressionist work by Mary Cassatt. AREAWIDE — How much do you know about the food you eat? Do you know where it was grown, or how was it planted, cultivated, and harvested? Were any harmful chemicals used? How healthy was the soil it grew in? Or the water that nourished it? 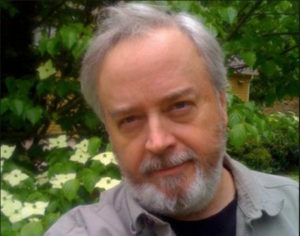 EAST HADDAM – A newly formed monthly “Boost Your Brain & Write” group will meet on Wednesday, June 13, from 1 to 3 p.m. at Morefit, LLC, 62 Creamery Road in East Haddam. Writers of all levels and genres are welcome to join this unique monthly writing and wellness group. This event includes one hour writing instruction, writing and peer critique, 15 minutes wellness exercise, and 15 minute Craniosacral Therapy (optional). Cost is $20 per person. Walk-ins are welcome. For more information or to sign up, email Srwaide@cs.com or sign up at www.meetup.com “Boost Your Brain and Write” under Health and Wellness or Writing. If you can’t meet during the day and would like to participate in an evening group, email your preferred time to Srwaide@cs.com. As part of this unique writing/wellness workshop, you will learn how Craniosacral Therapy (CST) can help you booth your creativity and improve your inner balance. You will have the opportunity to experience the benefits of Craniosacral Therapy. 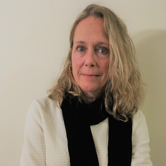 Instructors will be Susan R. Waide, who is a memoir teacher/coach, college professor, and writer/editor and Maryla Radziszewski, a licensed Massage Therapist, Craniosacral Therapist, Personal Trainer, Health Coach, and owner of Morefit LLC. 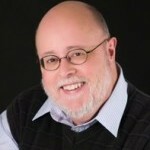 Under Sail: Author Thomas Halaczinsky will share his experiences aboard Sojourn in an illustrated talk and on an evening cruise aboard Onrust at the Connecticut River Museum, June 14. Photo: Thomas Halaczinsky. ESSEX — Enjoy a modern day exploration tracing Adriaen Block’s 1614 journey. On Thursday, June 14, at 5:30 p.m. Thomas Halaczinsky will share his adventures in a talk, followed by an evening cruise aboard Onrust. 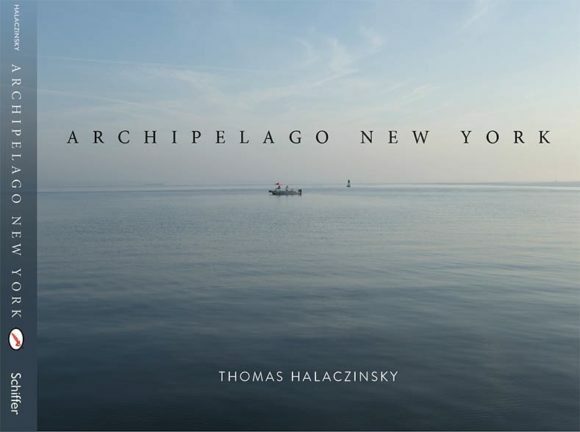 Halaczinsky’s new book Archipelago New York documents the photos and thoughts that he captured on a 3,000 nautical mile sailing expedition into the island world of New York. With a bunch of historical books and maps, a camera and an open mind, the German-born photographer, writer, and filmmaker departed from Brooklyn toward Long Island Sound and beyond. He followed Adriaen Block, a fellow European 400 years his senior, who had discovered the island world that stretches from Manhattan to Fishers Island on the Onrust, a wooden boat 14 and a half feet longer than Thomas’ fiberglass sloop Sojourn (built in 1980). Book Cover: Archipelago New York, by Thomas Halaczinsky documents the author’s journey retracing the routes sailed by Adriaen Block in 1614. Photo by Thomas Halaczinsky. Intrigued by mysterious names like Money Island, Pot Island and Rats Island, the artist delved into a search for a sense of place. From this journey, Thomas brings back stunning photography, historical facts and thrilling stories of explorers, pirates, and an African prince who tragically ended up as a slave on Fishers Island – twice. Following the lecture, Thomas will join the audience for a sunset sail on the Onrust. 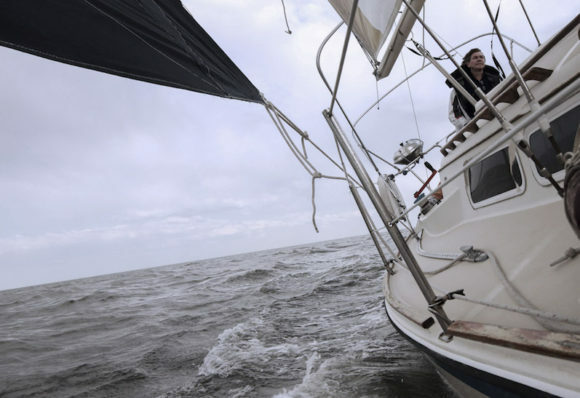 Weather permitting, the artist will sail to Connecticut River Museum on his boat, the Sojourn, and arrive on its dock on the afternoon before the lecture. To register for the program, call the Connecticut River Museum at 860.767.8269 x110. Space is limited. The lecture is free; tickets for the cruise are $38. Onrust: The Onrust, a replica of Adriaen Block’s 1614 exploration vessel, will host Thomas Halaczinsky for a special evening cruise June 14th. Please call the Connecticut River Museum to register. Photo: George Bekrist. In 1614, the Dutch explorer Adriaen Block and his crew investigated coastal New York, Long Island, Connecticut, and Rhode Island in pursuit of developing trade partnerships with Native Americans. Block became the first known European to travel up the Connecticut River to just north of Hartford (a distance of approximately 60 miles from Long Island Sound). The re-created Onrust was launched in 2009 by The Onrust Project, an all-volunteer non-profit out of New York, built the vessel after painstakingly researching traditional Dutch shipbuilding techniques. The Museum and the Project have again partnered to bring the vessel to Connecticut. The Onrust will be a floating exhibit at the Museum through early October. She will be open for dockside tours, school and Scout programs, along with public cruises and charters. Public cruises run June – October, Thursdays – Mondays at 2 pm, 4 pm, and 6 pm (sunset) on Friday & Saturday. For more information on the Connecticut River Museum and the Onrust, please visit the Museum’s website. The Connecticut River Museum is located on the Essex waterfront at 67 Main Street in Essex and is open daily from 10 am to 5 pm. The Museum, located in the historic Steamboat Dock building, offers exhibits and programs about the history and environment of the Connecticut River. For a full listing of Museum programs please visit www.ctrivermuseum.org or call 860-767-8269. This photo is one of the signature works by Elin Dolle on view at Essex Library during June. ESSEX — Photography has always been a part of Elin Dolle’s life going back to childhood when she received her first camera at age 8 or 9. 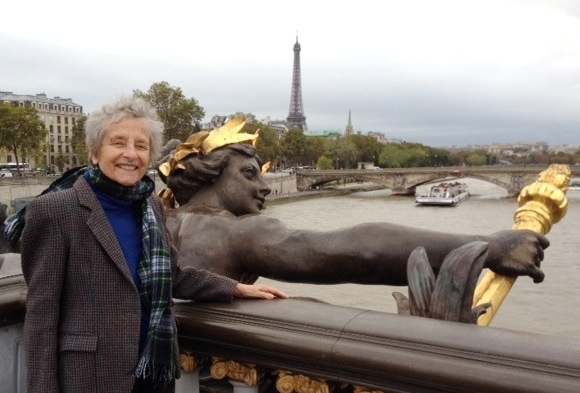 She enjoyed documenting the places she traveled as a child in a military family and as an adult on vacations. It was after a career in education that she decided to branch out and take her photography to a different level. 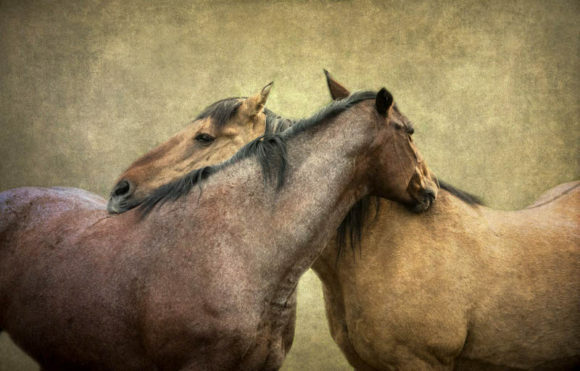 Another of Elin Dolle’s remarkable photos, which is on view at Essex Library. 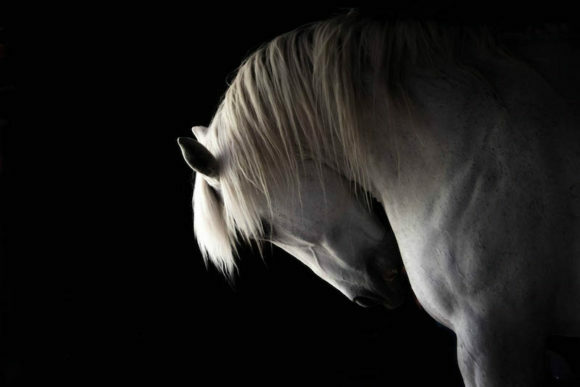 In that work, Strength and Resilience, as well as in her present project, Grace and Beauty, Dolle strives to depict not only the horses’ physical beauty, their strength and gentleness, but more importantly their dignity, and just maybe a glimpse into their souls. 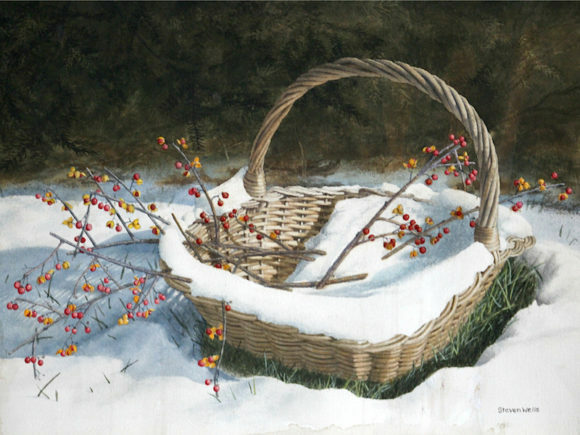 Her work has been shown in galleries throughout Connecticut; she has won numerous awards and has been published in several magazines including Black and White Photography magazine. It will be on display at the Essex Library throughout the month of June. AREAWIDE — Bring the joy of singing to your summer by attending Cappella Cantorum’s Summer Vocal Camp July 23 to July 27 from 7 to 9:30 p.m. at St. Paul Lutheran Church on Great Hammock Road in Old Saybrook. 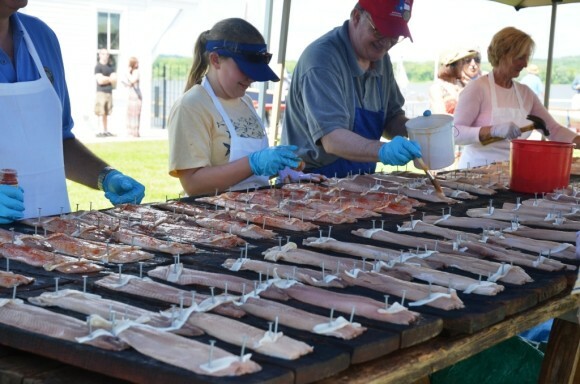 One of our State’s great culinary customs returns to the Connecticut River Museum Saturday, June 2, from 3 to 6 p.m. with the 2018 Essex Annual Shad Bake. For 60 years, the Rotary Club of Essex has been proudly holding this annual rite of spring, nailing delicious American shad onto oak planks and roasting them around a large bonfire. 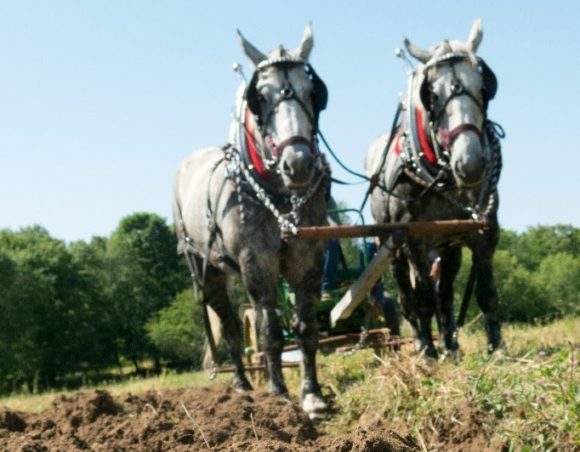 Share this wonderful Connecticut tradition with your family and friends. This year’s Bake is made possible through the generous support of Guilford Savings Bank and AJ Shea Construction. 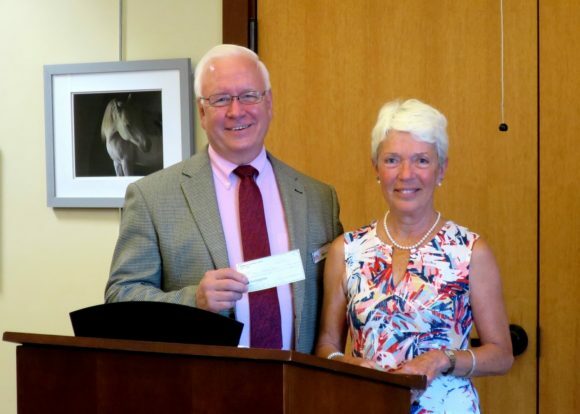 Additional support comes from The JECM Foundation, Norman Needleman & Jacqueline Hubbard, Essex Savings Bank/Essex Financial Services, Middlesex Hospital, Gallagher Buick GMC Inc., and many other sponsors. 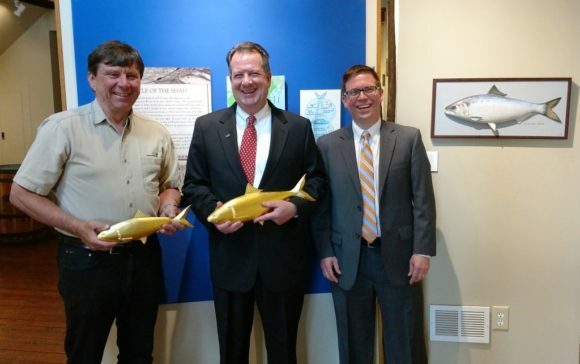 Representatives from the two lead sponsors, Bake Master Joseph Shea of AJ Shea Construction (left), and David Carswell Branch Manager of Guildford Savings Bank (center) join Connecticut River Museum Executive Director Chris Dobbs to celebrate the upcoming Shad Bake. 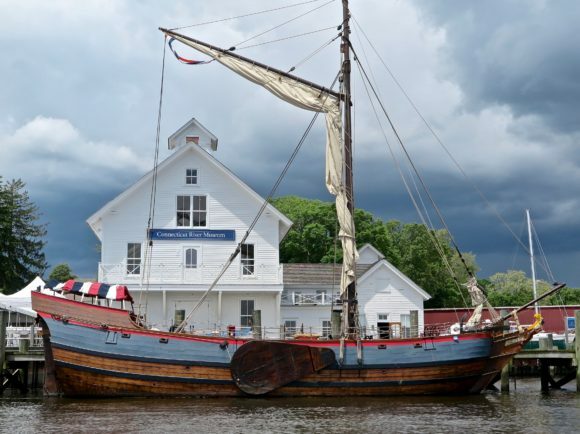 In addition to delicious food on Saturday, the Connecticut River Museum docks welcomes the Onrust for a second season of sailing on the Connecticut River. 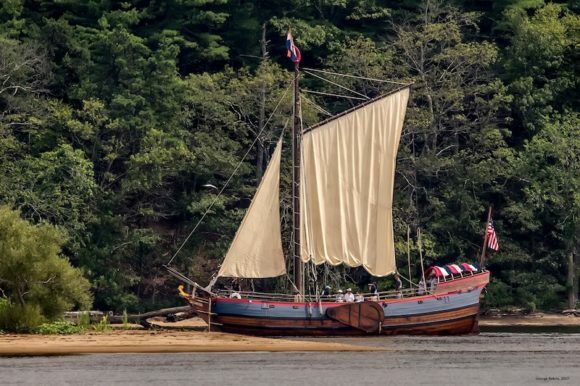 The historic replica vessel Onrust will be docked at the Connecticut River Museum through mid October for public cruises and programs. Photo by Judy Preston. At the shad bake, a variety of activities take place throughout the afternoon. 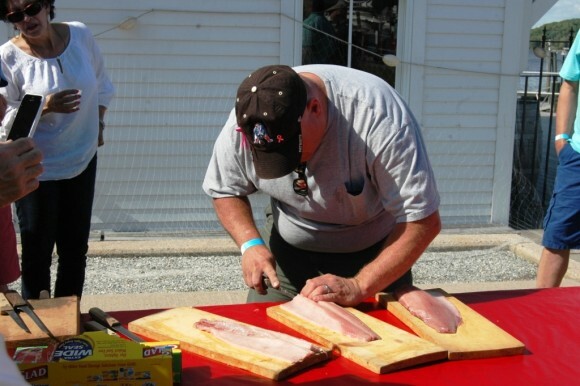 Join JB Lundgren for a deboning demonstration, Saybrook Point Inn Marina and Spa for a presentation on how to cook shad roe, and Al Moncovich for a shad wood carving exhibit. Always popular is Tim Visel’s historical diorama display of shad fishing through the years. The Connecticut River Conservancy, The Shad Museum in Haddam and the Connecticut River Museum will also offer programs on the history and traditions of the shad fishery. For shad lovers, the lure is the secret ingredients and the authentic method of preparing and baking the fish, which has been handed down through generations of Connecticut natives. 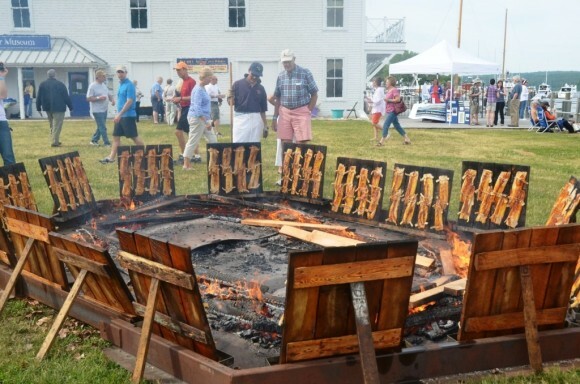 Nailed onto oak planks with salt pork and placed in front of the bonfire, the fish picks up the smoky flavor of the fire and the seasoned oak boards on which it is baked. Add to this delicacy homemade potato salad, tossed green salad, and pie from Lyman Orchards and your shad experience is complete. Don’t care for shad? Grilled chicken is also available. In addition to the food, participants will be able to enjoy live music and tour the Museum, which will be open until 6 p.m. The vibrant atmosphere is enhanced with picnickers and the delicious smell of shad baking around the open fire. Buy your tickets today. The $30 adult (shad or chicken dinner option) and $10 child (10 and under) ticket includes the full meal (child ticket includes a hot dog and salads) and admission to the Museum. Tickets will be an additional $5 on the day of the event. Beer, wine and soda will be available for purchase with a valid ID. Freshly shucked clams and oysters will also be available at an additional price beginning at 3:00 pm. No carry-in alcohol will be permitted. 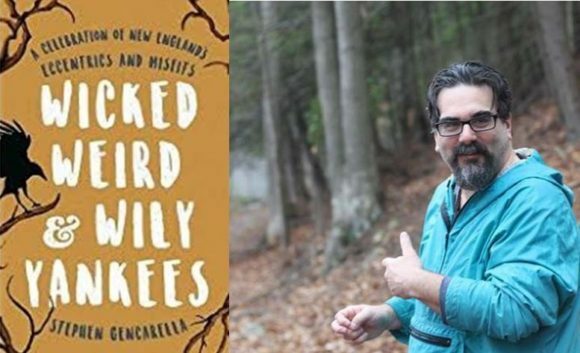 To purchase tickets, visit shop.ctrivermuseum.org or buy them in person at the Centerbrook Package Store, Essex Hardware, or the Connecticut River Museum. There will be no parking on the Museum grounds and on-street parking is very limited. On the day of the event, a free shuttle will be running between the Museum and the Essex Town Hall parking lot. The Connecticut River Museum is located on the Essex waterfront at 67 Main Street and is open 10 a.m. to 5 p.m., closed Mondays until after Memorial Day. The Museum, located in the historic Steamboat Dock building, offers exhibits and programs about the history and environment of the Connecticut River. For a full listing of Museum programs and events, visit www.ctrivermuseum.org or call 860-767-8269. The Rotary Club of Essex is the local chapter of Rotary International whose membership is made up of service minded professionals. 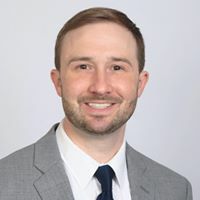 The club and its members are committed to improving the community, connecting with other professionals, sharing their time and experience with the young, supporting global causes, and using their skills to help others. For more information about the Shad Bake and Rotary Club visit http://www.rotaryclubofessex.com. Members of The Rotary Club of Essex season and plank the Shad to cook in front of the fire just as it has been done for hundreds of years.